Outside First Presidential Debate, 24 Arrested at Protests & Jill Stein Escorted Away by Police | Democracy Now! Hundreds of people protested outside the debate at Hofstra University on Monday to demand the presidential debates be opened up to third-party candidates. At least 24 people were arrested. Green Party presidential nominee Dr. Jill Stein was escorted off campus by Hofstra security and Nassau County police, despite the fact that she was invited on site by MSNBC, ABC, Fox and CBS for interviews. Democracy Now! was there at Hofstra and brings you this exclusive report. AMY GOODMAN: In one of the most anticipated debates in recent U.S. history, Donald Trump and Hillary Clinton sparred last night on race, terrorism, trade, jobs and stamina, in their first of three debates before the November election. 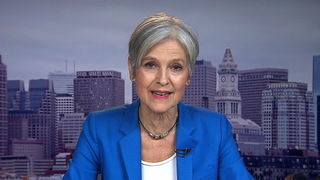 In a moment, we’ll air excerpts from the debate and expand the debate by giving Green Party presidential candidate Jill Stein a chance to respond to the same questions posed to the major-party candidates. Stein and Libertarian presidential candidate Gary Johnson were excluded from last night’s debate at Hofstra University under stringent rules set by the Commission on Presidential Debates, which is controlled by the Democratic and Republican parties. Well, on Monday afternoon, Dr. Stein was escorted off the campus by Hofstra security and Nassau County police as she attempted to do an interview, among other networks, with MSNBC. Just before the debate began, Stein addressed supporters who were protesting the exclusion of third-party candidates. Democracy Now! was there. PROTESTER: What do you want? PROTESTER: When do you want it? DR. JILL STEIN: Tonight is a turning point. We can no longer going forward into the future and allow ourselves to be silenced, to be intimidated and to have our political power ripped from us. So we say it’s time to reject the lesser evil and to fight for the greater good. And we will go forward knowing that we do have the power to create an America and a world that works for all of us. And the power to create that world is not just in our hopes. It’s not just in our dreams. Right here and now, outside the barred gates of Hofstra University, that power is in our hands. PROTESTERS: Let her in! Let her in! Let her in! Let her in! DEENA GUZDER: Jill, Jill, it’s Democracy Now! We just want to get at this. What happened today? What happened today? This is Democracy Now! What happened today? HANDLER: Jill, Jill, get in the car now. Jill, you have to get in the car now. HANDLER: Jill, you have to get in the car now. DR. JILL STEIN: —they attracted the attention of security. HANDLER: Jill. Thank you. All right, thank you. DR. JILL STEIN: And we were escorted off of the campus. CHERI HONKALA: We’re going to go inside, and I’m going to ask if they will open the debates. All right? [echoed by the People’s Mic] We have a right to participate in nonviolent civil disobedience. POLICE OFFICER 1: Currently, right now, you’re blocking traffic allowing people to come in and out of the parking lot. POLICE OFFICER 1: We are asking you to please move to the sidewalk. CHERI HONKALA: We are going to have a seat, and we’re going to wait for them to bring us somebody from the Commission on Presidential Debates. Have a seat. CARLOS JESUS CALZADILLA: My name is Carlos Jesus Calzadilla, and right now we’re demanding Jill Stein to get into the debates, because this is supposed to be a democracy. We’re supposed to have dialogue amongst many people, not just two. And the commission on debates is controlled by the Republicans and the Democrats. We are demanding right now an America, where supposedly we have freedom of speech, to open the debates and let Jill Stein and Gary Johnson participate in them. POLICE OFFICER 2: Ladies and gentlemen, you are obstructing vehicular traffic. If you refuse to move, you are subject to arrest. BENNETT WEISS: Bennett Weiss. We’re blocking the road, because we want an open debate. They want an open road, which will affect a few handful of vehicles. We want an open debate that will affect the entire world. We either move, or we get arrested. I am prepared to get arrested. POLICE OFFICER 3: Can you turn around please? DEENA GUZDER: Can you narrate what’s happening, Cheri Honkala? DEENA GUZDER: Narrate exactly what’s happening. CHERI HONKALA: I’m having handcuffs put on right now and going to jail because I believe everybody should be a part of the presidential debates. POLICE OFFICER 3: Turn around. Turn around. AMY GOODMAN: That’s Cheri Honkala, the Green Party’s 2012 vice-presidential candidate, one of about two dozen people who were arrested Monday outside the debate at Hofstra University. Special thanks to Deena Guzder and Hany Massoud for that report.